PLEASE PROVIDE MORE DETAILS ABOUT WHEN YOU WOULD LIKE YOUR TOUR TO START AND FINISH? I.E. 9:30AM ON 1ST DECEMBER FINISHING 5:00PM SATURDAY. PLEASE SELECT THE ACTIVITIES AND EXCURSIONS YOU ARE INTERESTED IN INCLUDING AS PART OF A TAILOR-MADE DAY TOUR. Mojito Making Lesson on Roof-top in Old Havana (1 hour). Sunset Convertible Classic Car Tour to El Morro and El Cristo de la Habana statue (1.5 hours). Visit Fabrica Cubano (2+ hours, Thursday, Friday, Saturday, Sunday only). Adults only. Vixen and Crow Jazz Club (1+ hours from 10pm onwards). Adults only. Visit Casa de la Musica (1+ hours from 5pm onwards). Adults only. Visit Tropicana Cabaret (4+ hours from 9:30pm onwards). Adults only. Visit Parisien Cabaret at Hotel Nacional (4+ hours from 9:30pm onwards). Adults only. La Taberna for Buena Vista Social Club Music (2+ hours from 9:00pm). Adults only. Vinales Day Tour (Los Jasmines Look-out point, walk/ cycle through Vinales Valley and the surrounding farmland to meet local farmers, lunch at organic farm, visit tobacco farm and drying house, Mural Prehistoria). Full Day with 6 hours of transportation included. Las Terrazas/ Soroa Day Tour (Zipline, Soroa Waterfall, Orchid garden, Buena Vista Coffee Plantation, San Juan River). Full Day with 4 hours of transportation included. Varadero/ Matanzas Day Tour (guide township walk of Matanzas, visit Varadero township, lunch at Cuban paladar, relax on Varadero beach). Full Day with 5 hours of transportation included. 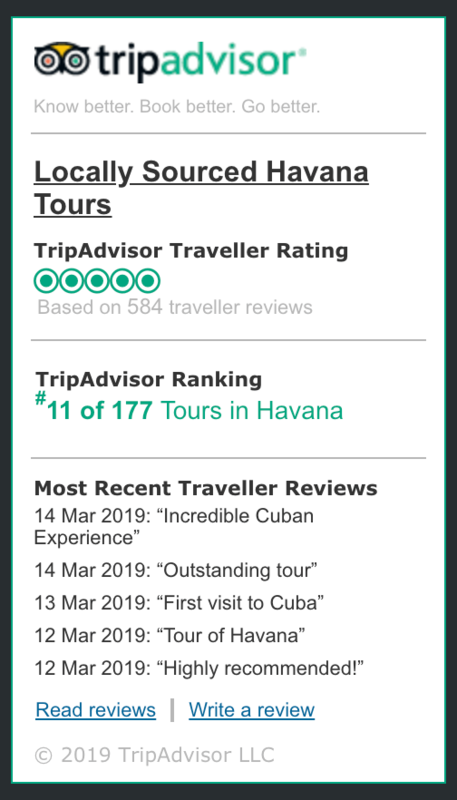 Day Tour to Zapata Peninsula and Bay of Pigs (Playa Giron Museum, Tainos Indian Villiage, Lunch at Cuban Paladar, Swim/ Snorkel at the Bay of Pigs. Full Day with 6 hours of transportation included.